1 of 5 In a medium bowl, whisk together orange juice, olive oil, lemon juice, vinegar, orange zest, 3/4 tsp of the salt, the sugar, pepper and scallions. 2 of 5 Place chicken in a ziptop bag and add 3 tbsp of the citrus dressing. Seal bag and shake to coat chicken with dressing. Marinate in refrigerator for 2 to 4 hours. 3 of 5 Heat a gas or stovetop grill to mediumhigh or the coals in a charcoal grill to medium-hot. Remove chicken from marinade and discard marinade. Grill chicken 7 to 8 minutes per side or until internal temperature reaches 160 degrees . Slice chicken thinly on the bias. 4 of 5 In a large salad bowl, combine rice, arugula, carrot, cucumber and mint. Toss with 4 tbsp of the citrus dressing and season with remaining 1/4 tsp salt. 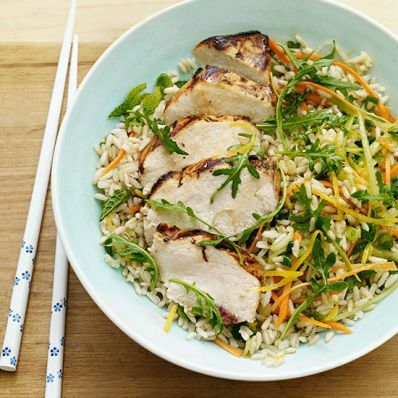 5 of 5 Serve rice salad with sliced chicken and drizzle with remaining dressing.